In an Exploration view, it is possible to extend the focus. In other words, it is possible for a group of elements not in focus to become elements in focus, thus expanding the dependency calculation of the view with the dependencies for the selected elements according to the current focus mode of the view. This view has been created by selecting the "console" namespace with focus mode "In and Out", that is, showing incoming and outgoing dependencies. Let's suppose that for whatever reason, "AlarmHandler.java" becomes an element of interest of the user that created this view and it is important to see how it is related to the elements in the view other than "console". 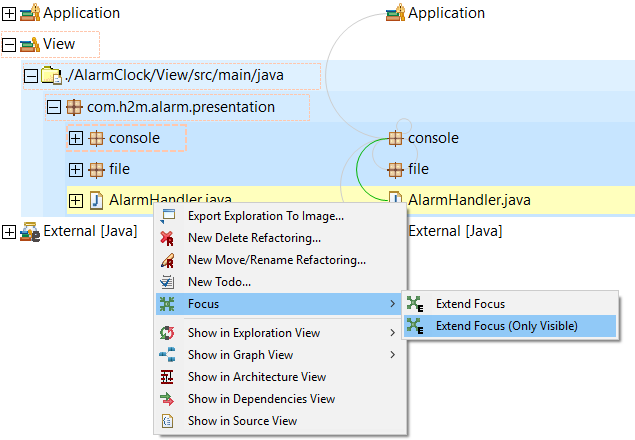 This can be achieved by right clicking on the element and selecting "Focus" → "Extend Focus (Only Visible)"
The result of this operation is having both "console" and "AlarmHandler.java" as elements in focus and the rest of the visible nodes as element not in focus.